The chicken in this recipe is coated in a fiesty Creole spice mix. If you prefer less bite you can reduce the amount, or serve with cooling low fat yogurt. Preheat the grill to its highest setting. Using a sharp knife, score each chicken breast 3 times. Place the chicken and spice mix in a freezer bag and seal the top. Toss the meat in the spices until evenly coated. Place the chicken under the grill and cook for 6 minutes on each side until the juices run clear when pierced with a sharp knife, and the meat is cooked through. Meanwhile, cook the rice according to pack instructions. Tip into a mixing bowl. Add the pineapple, coriander, salad onion and chilli to the rice, mix and season. 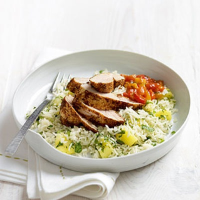 Serve the chicken sliced on a bed of the warm rice salad, with some salsa.